Why phosphates are problem in recreational water? Because when phosphates are present they consume sanitizing chemicals…..
Phosphates are pollutants that are environmentally and unintentionally introduced into water…..Phosphates are food for algae, molds and other microorganisms. As phosphate levels increase, these organisms start to multiply at excessive levels, consuming chlorine and bromine as quickly as it is introduced. Phosphate is the main ingredient in fertilizers, almost all soaps, detergents, human care products and even pool and spa chemicals used to removal metals and clean filters; in fact many municipal water treatment plants add it to water to protect the plumbing from corrosion. They can quickly accumulate in recreational water and cause numerous problems. In many cases, the water used to fill pools and spas may already contain phosphates. Remove the Phosphates and solve the problem…..
Fortunately, today there are numerous chemical treatments for coagulating phosphates. So draining a pool or spa is no longer necessary. As these chemicals sequester (coagulate) the phosphates, the water will be temporary cloudy or milky, this is natural and will go away as the phosphates collect on your filter. Your filter must be cleaned thoroughly after each application of a phosphate remover and the filter cleaner must not contain PHOSPHONIC ACID!!! Depending on the degree of your pool or spas contamination, several applications of the phosphate removal product may be required. Don’t let the phosphates bring you down. Stop them in their tracks. See Outdoor Living for your phosphate removal products. GLB TripleTab Chlorinating Tablets sanitize pool water, prevent algae and clarify pool water. 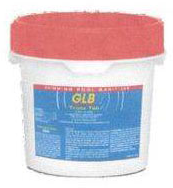 GLB TripleTab Chlorinating Tablets are slow dissolving and stabilized for extended chlorine life. Add one tablet per 10,000 gallons of pool water every week or as often as needed to maintain a chlorine residual at 1.0 to 4.0ppm. This dosage may vary depending upon bather load, water temperature and other conditions. Pool should not be entered until the chlorine residual is 1 – 4 ppm as measured with a reliable test kit. As a preventative treatment, you should shock treat your pool once per week to prevent pool problems. In addition to weekly shock treatment, you should shock treat to remedy problems which may occur when bathing loads are high, water appears hazy or dull, unpleasant odors or eye irritation occurs, after heavy wind and rainstorms, or if algae does develop with resulting green color and slimy feeling. Adjust pH to 7.2 to 7.4 with GLB pH or GLB Ph Down per label directions. Shock treat weekly with a product such as GLB Oxy-Brite non-chlorine shock oxidizer, GLB Shoxidizer shock oxidizer or GLB SuperSonic to kill bacteria, control algae, burn out organic material and to keep water sparkling clear. Follow label directions. If pool surface develops algae or feels slippery, follow shock treatment directions. Immediately after shock treatment, thoroughly clean pool by scrubbing surface for algae growth , vacuum and cycle through filter. If necessary, repeat the procedure. Pool must not be entered until the chlorine residual is 1 – 4ppm. Just bought a used spa and don’t know what to do next? Once you have the electric hook-up complete, you will need to fill your spa will clean water, and heat your spa to the hottest temperature allowed (usually 104 degrees). I know you will be tempted to get into the tub, but I wouldn’t if I were you. There’s a lot of bacteria and germs in your tub just waiting for you. Here’s why, hot tubs have plumbing running all through the cabinet below and that plumbing is holding skin follicles, oils, and hair from every person that has been in that spa. It’s a good idea to clean out the plumbing with Leisure Time Jet Clean. Be sure to follow the instructions, drain the tub, and refill the tub for your use. Then simply follow the instructions below on sanitation and maintenance. How often you shock spa water depends on the sanitizer used and the bather load. If you are using chlorine or bromine tablets, it is recommended that you shock at least once a week. It may be necessary to shock more often if the bather load is heavy or the water is cloudy. Absolutely. Water that is low in calcium hardness can be corrosive to other metal parts in your spa, particularly your heater. We recommend maintaining a calcium hardness level of 150 – 400 ppm. Non-chlorine shock for pools is not buffered and may affect the overall water chemical balance of the spa water. It is best that you use a non-chlorine shock, such as Rendezvous ACTIVATE or Leisure Time RENEW which are designed specifically for spas. This will help reduce the need for extra chemical treatment to keep pH in the proper range. My spa has odd-shaped white chips on the bottom after I shut it off! Where’s this stuff coming from? The white chips are calcium deposits (scale which forms on the heater elements) which are knocked off by the jets and blowers in the tub. This problem can be prevented by using a sequestering agent, such as Leisure Time SPA DEFENDER on a weekly basis to prevent calcium in the water from forming deposits. If you are using box store chemicals, it could be the use of inert ingredients used in the product. Be aware of box store chemicals due to the fact that the filler ingredients have been found to clog pumps. I just refilled my spa and I’m having problems balancing my water. The pH is low, and the total alkalinity is high. What can I do to fix it? When the pH and the total alkalinity are opposite levels of one another, always fix the lower number first. In this case, add a pH increaser until the pH is within a normal range. Then you will adjust the total alkalinity by adding a pH level reducer. Leisure Time pH BALANCE or GLB’s Rendezvous pH MAGIC after this will lock your pH into the proper range. My cartridge filter is dirty, and I was told to put it in my dishwasher to clean it. Is this the best way? The dishwasher will clean out the larger debris, but can also damage the fabric on the filter. The best way to clean your filter is to use a filter cleaner that contains both acids and detergents these are designed specifically for cartridge cleaning. This will ensure that all oils, lotions, and minerals will be removed from the filter. Cleaning properly increases the longevity of the cartridge. Check your cartridge filter once a month. Try Leisure Time FILTER CLEAN. My dealer tells me not to use soft water (low calcium level) in my spa. Why is the calcium level important to my water’s balance? Too little calcium in the water can cause corrosion, particularly in heaters and other metal components. To increase the hardness to the recommended level of 150-400 ppm you need to add a calcium hardness increaser such as Leisure Time CALCIUM BOOSTER or Rendezvous LIQUID CALCIUM HARDNESS UP. Too much calcium can cause scaling on the walls and heating elements or cloudy water. To prevent calcium in the water from causing these problems, add a sequestering agent such as Leisure Time SPA DEFENDER, Rendezvous PROTECT PLUS or Robarb METAL-X. I am using bromine tablets to sanitize my spa and the directions for use say I need to add a “bromide bank” first. Why do I need to do this? It is recommended that you add this “bank” in order to ensure the sanitizer in your water is all bromine from the moment you first start using it. Should I treat my spa water the same way as I treat my pool water? Although the pH and total alkalinity, measurements are the same. The sanitizer level (bromine or chlorine) should be kept between 3-5 ppm. For a spa, the spa filter requires more frequent cleanings. In addition, the water will require more care to assure pH and sanitizer levels are correct. 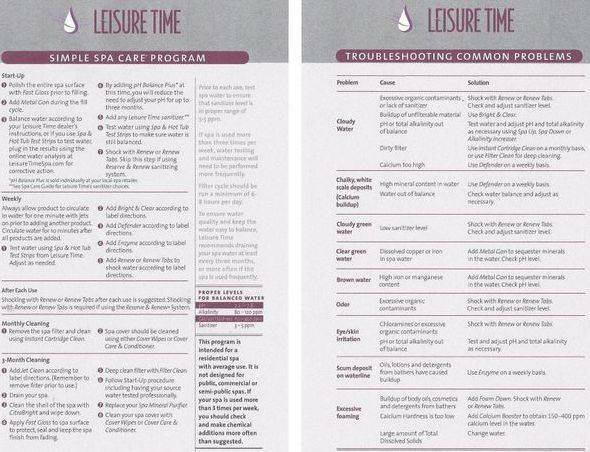 For further details, please see our spa care guides for Leisure Time, Robarb, or GLB’s Rendezvous spa line.